Over the years, we’ve had countless phone calls from people panicking and upset after receiving a service from a carpet cleaning company that didn’t produce the results that they promised. It’s always frustrating for us to hear that another local carpet cleaner has taken the money of a customer that trusted them with their property, only to then leave them back at square one, out of pocket and stressed. Are they professionally trained through the IICRC or NCCA? Don’t feel embarrassed to ask. If they’re trained professionally, they’ll be more than happy to show you their certificates. Are they insured? This one is important. Find out if the carpet cleaner is insured and if they have Treatment Risk as part of their cover. If not, they’re not covered to service your property and you should look elsewhere for a carpet cleaner. Do they have past testimonials? If the company has testimonials and reviews from past clients, it’s worth taking a look. Most good companies will have a Facebook page, Google Business page or website where you can find reviews to look at. What equipment do they use? A professional carpet cleaning service requires professional carpet cleaning equipment. Look on their website for pictures of large, shopping trolley-sizes machinery. A lightweight machine that can be easily carried is not going to be enough for a thorough clean. Are they uniformed? All good companies are proud companies and will put thought into things like uniforms and vehicle branding. Do they offer quotes upon visit or over the phone? If the company quotes you over the phone, chances are: the number will be inaccurate. 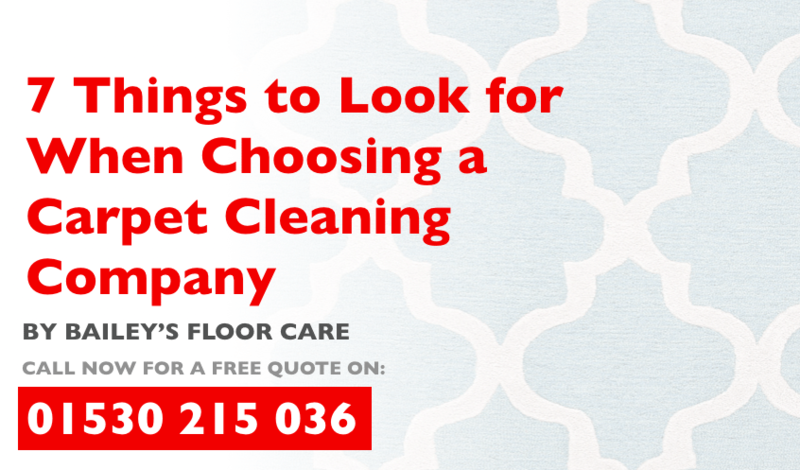 The only way to get a calculated price on a carpet cleaning service is to see the job first-hand. Over-the-phone quotes will often be over priced. Do they offer a money back guarantee? A carpet cleaner that is confident in their services will always provide a guarantee of some kind. Don’t be tempted to pay cheaper for a company that doesn’t offer a guarantee, as you may end up paying even more when you need the job re-doing by someone else. So there you have it. How to choose a carpet cleaner in 7 simple steps! Are your carpets in need of a good clean? If your carpets have become dull over the past few years and you’d like to have them restored instead of investing in new carpet, talk to the team at Bailey’s Floor Care today about how we can help. We’ve been providing professional carpet cleaning in Leicester, Derby, Nottingham and surrounding areas for nearly 2 decades now, so you can rely on us to provide you with a great service. You can call us directly on the number above or send us a message via our contact form. We regularly providing carpet cleaning in Derby, Leicester, Nottingham, Northampton and Warwickshire areas, so we’re never too far if you need us!